After the war, locals who had been unfairly painted as rustlers and attacked by the Invaders, were understandably ambivalent about people who were called outlaws. This made it a great place for rustlers to reside and escape the law. 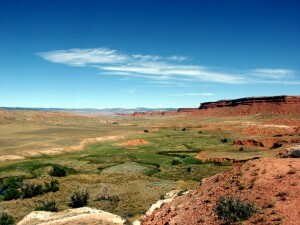 Outlaws, such as the Wild Bunch, were known to frequent the area known as the Hole in the Wall, west of Kaycee. There were really three types of people considered outlaws by the law at the time. The first group usually began their careers with rustling cattle, moved on to horse theft, and then robbing banks and trains. While good with guns and able to defend themselves, they were not particularly violent or murderous. They were often genial characters and well-liked by their neighbors. The second type of outlaw not only stole livestock, horses, and robbed banks and trains, but was violent as well. The third type of outlaw was someone who rustled cattle for a living, or associated with and helped the outlaws in some way. They were probably all good with guns and could defend themselves. It would take some time before the local population would tire of their outlaw neighbors, and some would say they never did. Many of the people who were on the Invaders side in the Johnson County War left the country for a time, and there were hard feelings on both sides for many years. It was into this climate that the outlaw element found refuge into the early 20th century. Some of the most famous outlaws who were in the area were Butch Cassidy (Robert Leroy Parker) and the Sundance Kid (Harry Alonzo Longbaugh). Working up from cattle and horse theft, the two made a living by robbing banks and trains. While Butch was absent from the Kaycee area most of the time, some of his associates spent a great deal of time in southern Johnson County, and became known as the Hole in the Wall Gang or Wild Bunch. 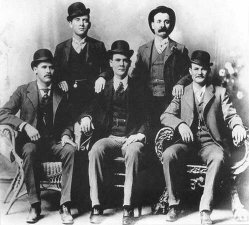 This group included Longbaugh, Harvey Logan, known as Kid Currie, Flat Nose George Currie, Tom O’Day, Al Smith, and George Smith. 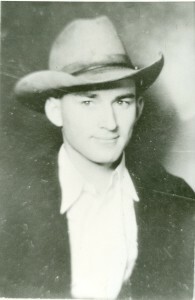 Flat Nose George Currie was probably the locally favorite outlaw. He was well-liked among the Hole in the Wall Gang itself and known for various kindnesses, particularly to the local Brock family. He even occasionally minded the post office run by the Brocks in their absence. On one occasion, they returned later than planned from their trip to find him camped outside, cooking food he had hunted rather than from their pantry. When asked why, he said it would be stealing to take food without their permission. Of the rustler category in the Hole in the Wall Gang were brothers Al and George Smith, who formed the core of the local gang. With the lingering animosity from the Johnson County War, they enjoyed rustling cattle from the big outfits. Their headquarters were in the Hole in the Wall, a remote, large valley west of Kaycee flanked by mountains and red cliffs known as the Red Wall. It was an ideal place to hide from the law and hide stolen livestock. The Smith’s had a homestead cabin next to a white bluff on the Buffalo Creek, which according to people who knew them, was referred to as the Hole in the Wall, rather than the entire valley. The name emerged, or so the story goes, when Al Smith was asked where his mail should go, and he replied “Just stick it in a hole in the wall,” referring to the white cliff wall behind his cabin. This is the historical origin for the Hole in the Wall area.